Two different seat designs offer you the flexibility to choose the right valve for your application. BOS Resilient Seated Butterfly Valves are designed to handle a wide variety of liquids and gasses. They are available as lugged or wafer bodies, with Ductile Iron/Nickel Plated or 316 Stainless Steel discs. BOS Valves feature a one-piece body; one-piece shaft and high-performance resilient seats made of EPDM, NBR or FKM. Both the On-Center and Uninterrupted Seat versions provide bi-directional shutoff to the full rating of the valve, and are AWWA C504 proof-of-design cycle tested. The BOS seat bonding process provides a long lasting, maintenance free seal. Our experience and proof-of-design testing assures that the molded seats are maintenance free for the life of the valve. Three heavy-duty bearings ensure smooth, reliable valve operation. Shaft seals protect bearings from internal and external corrosion. The ISO actuator mounting flange is per ISO 5211 and accommodates all types of actuators – including levers, gears, pneumatic cylinders and electric motors. Every BOS valve is tested for leakage, shell pressure and to be operational with actuator. Manufactured and tested per ISO 9001 standards as well as API 609 and MSS SP-67. The BOS seat bonding process provides a longlasting, maintenance-free seat. Our process ensures the seat is held frimly in place – bonded to the body on Uninterrupted Seat design and to a rigid backing ring for the On-Center design – eliminating premature seat failure that occurs due to flexing and fatigue. Our seat designs assure dead-tight shutoff in isolation and deadend service without requiring downstream flanges. performance when the line maintains a vacuum, or when handling viscous liquids – circumstances that tend to dislodge seats that are not solidly connected. BOS valves have integral flange seals, eliminating the need for flange gaskets. Three heavy-duty bearings ensure smooth, reliable valve operation that promote a longer cycle life than valve designs without bearings. They are press fit into the valve body to support shaft loads and eliminate binding. In addition, shaft seals protect bearings from internal and external corrosion. The BOS stem sealing technology offers maximum reliability. It uses four separate sealing components for continuous protection from leakage. Disc hubs form the primary seal around the shaft. Two additional seals are molded into the seat. They give you complete confidence in the reliability of our BOS valve. For user safety, each valve has a blowout proof stem per API 609. On-Center Seat design provides a streamlined disc with high flow capacity. Proven pin disc-to-shaft connection and blowout proof stem per API 609 provide years of safe, trouble free service. Suitable for many industrial applications such as water treatment, power, mining, pulp and paper and automotive where heavy-duty resilient seated butterfly valves are required. 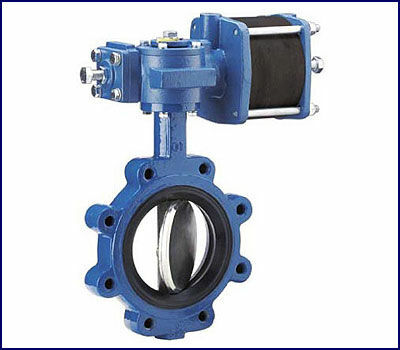 The on-center BOS butterfly valve is suitable for liquids and gases. Designed for both on-off and throttling. By using an off-center disc, BOS valves have an uninterrupted seat design for improved seating performance, resulting in longer seat life. BOS-US valves feature a rugged, splined disc-to-shaft connection. This provides high cycle life and great control performance. Stem diameters meet AWWA 504 Class 75B standards. Blowout proof stems per API 609 standard. The uninterrupted seat BOS valve is desirable for applications where extended service applications are necessary such as: high cycles, high pressures, and high temperatures. Excellent for continuous modulating control, dead-end service to 250 psi, and vacuum service to 24" Hg. The mounting pad on BOS valve is compatible with most standard actuators. The ISO bolt pattern allows for the standardization of actuators. A wide range of manual actuators, including manual worm-gear handwheels, chainwheels, compact, G-series, electric motor and levers may also be ordered. DeZURIK cylinder actuators have demonstrated reliability, with performance to match. These actuators utilize a rack and pinion design for smooth and efficient operation. Cylinder barrel is not only corrosion resistant but also highly impact resistant fiberglass resin composite. At the heart of the cylinder is a unique piston seal design that applies a triple teflon wiper with nitrile rubber backing for resiliency. This seal design has been used in our cylinders for decades with proven reliability and long life. Compact actuators utilize a versatile rack and pinion design for use on 11/2 –6" (38–152mm) BOS-CL valve. The compact, modular design allows the actuator to be mounted for a low profile assembly. Compact actuators are also environmentally shielded to protect internal parts from grit, moisture and corrosive contaminant. The actuator body is extruded, machined, anodized internally and externally, and finally powder-coated for maximum internal and external protection. Compact pistons are aluminum and the pinion is stainless steel. Both pistons incorporate a large wear band which significantly increases cycle life. Upper and lower bushings minimize wear and increase actuator duty cycle. DeZURIK manual actuators are constructed for dependable and long-lasting performance. We offer a full line of extensions and accessories, including enclosed neck extensions, extended operating nuts, floorstands, valve boxes, floor boxes, solenoid valves, switches, speed-control valves, positioners and electric motor operators.